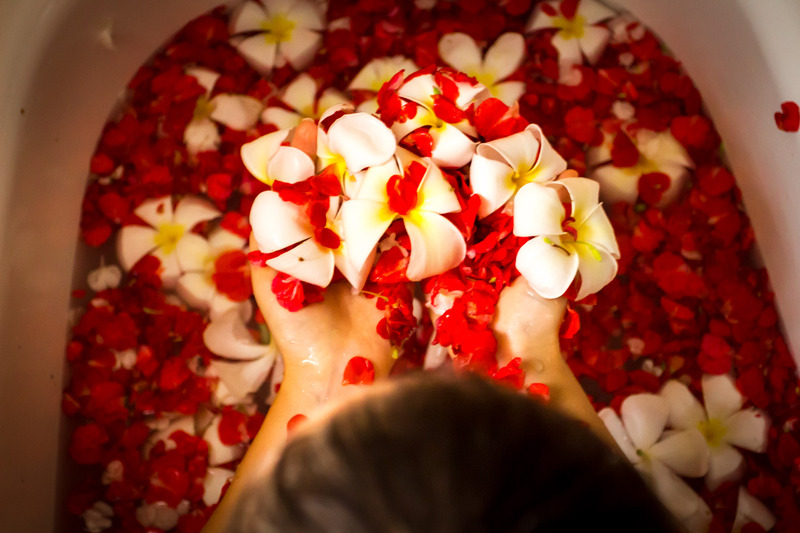 As I sat down in my comfortable beige sofa in the Balinese lobby of Spa Village Tembok and my feet are soaked in the warm flower bath that is part of the Welcome Rituals, I realized I have forgotten about the three hour journey from the airport. “This just made it all worth it”, I say out loud, almost without realizing. 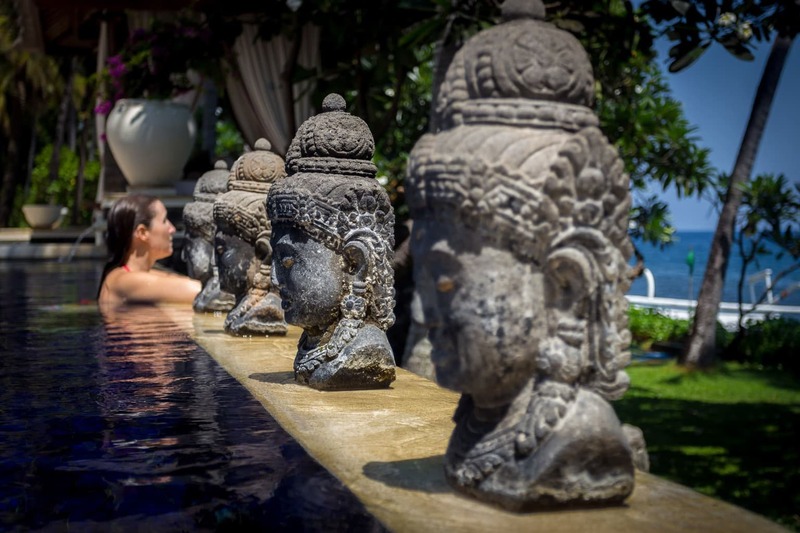 Spa Village Tembok is in the Northern shore of Bali, a part of the island that is rarely visited by the short-term tourists filling the beaches and restaurants in the South. The area is rugged and volcanic and there are no bars or fancy restaurants. 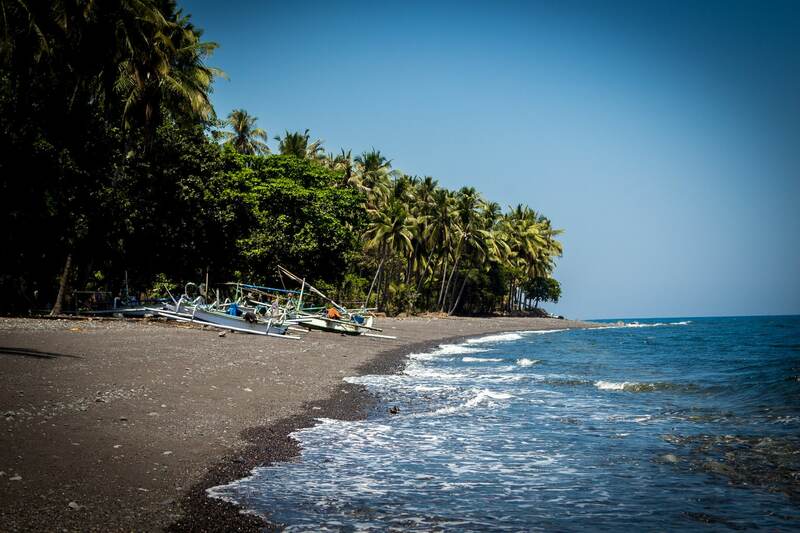 The black sand beach is lined up with tall green palm trees and, behind the forest line, the majestic volcanos of Mount Batur and Mount Agung rise unexpectedly. The landscapes are nothing like the usual images of Bali for the area is a combination of wild nature, waterfalls, mountains and traditional Balinese ways of life. I feel closer to Hawaii than to Indonesia. My neck and shoulder massage is just what I needed when I got out of the car, leaving my luggage behind. The journey in the resort’s van was comfortable and we even had a neck pillow and ginger sweets to entertain the hunger but it was the end of the week so we were ready to relax and disconnect. As soon as we step out of the car, we are welcomed with a natural glass of coconut water, lime, honey and mint and a cold towel smelling like lemongrass while check-in takes place. Fully relaxed and ready for a pampering stay, we are escorted to our room through dimly lit alleys and palm tree fringed gardens. In the room, our pre-ordered light dinner is awaiting, together with a plate of freshly sliced fruit and a warm ginger tea resting on the bed. A quick introduction to the room and we are left to start our wonderful Lovers Retreat. As I tucked into the glass noodles, I hear Alex calling me from the bathroom, “You have to see this”. I walk in to find a candle lit room and a flower bath reading, “Enjoy your bath”. We definitively did. This was just the beginning of a friendly and personal stay. The water was warm, the bath had clearly been ran just before we stepped into the room, and the flowers were fragrant and beautiful, hand laid on the edges to read the message. 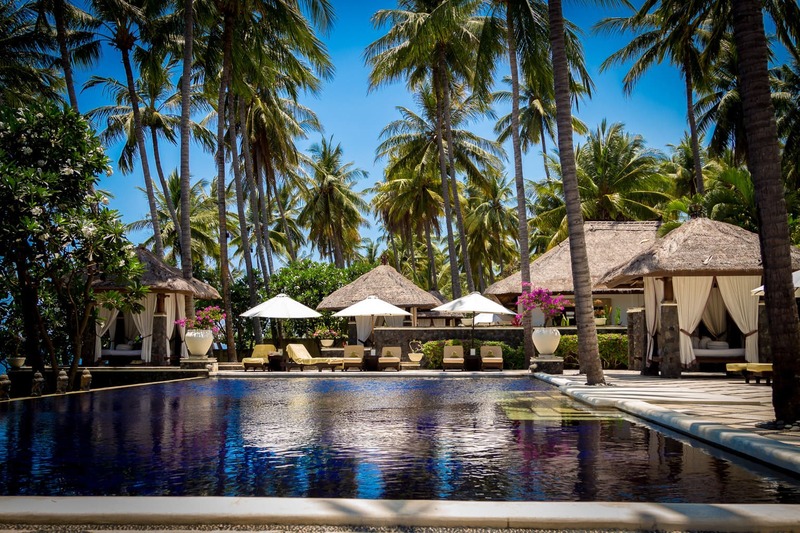 Spa Village Tembok has 33 rooms, two suites and two villas with their own private pools. 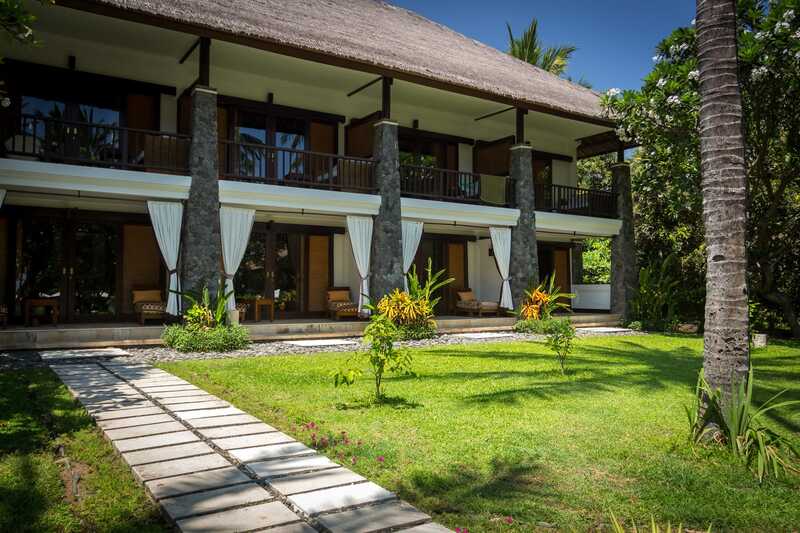 The rooms are spacious and come with an outdoor veranda with a sofa and a table facing the sea. The two story buildings surround a large garden with palm trees and a lily pond. They are styled with Balinese furniture and decor. Aside from a large bed, there is a lounger and a desk, but no TV in sight.”There is WiFi only in the reception”, told us Fauzi, the Resort Manager, as we checked in. Rooms were nice without being ostentatious. They were well-taken care of and decorated using local materials. Lontar leaf scriptures hanged from the walls and bamboo was occasionally used. The bathroom had marble floors and walls. Every morning and every evening, after the room was serviced, the room attendants left us thoughtful notes on the bed, next to beautiful frangipani flowers. 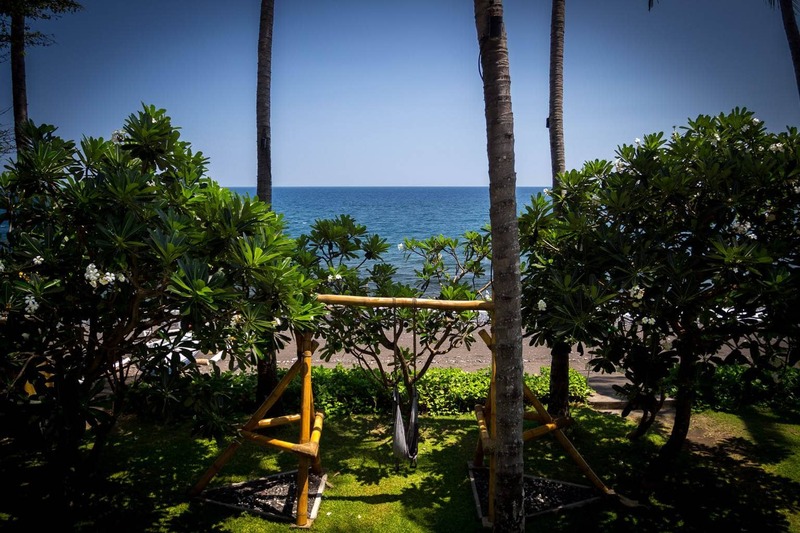 Spa Village Tembok is located by the sea, on the Northern black sand shore of Bali. The beach is in front of the resort’s pool and gardens and is made of fine sand, small pebbles and larger volcanic rocks. The resort provided Crock-style shoes to get into the water. Farthest away from the water edge, the sand was fine and soft and it got progressively rougher as we approached the water. The pool was rectangular and good for swimming. Four cabanas at each corner of the pool provided a relaxing and private retreat perfect for couples wanting to re-connect or escape the sun. Various sun loungers were lined up at each side of the pool. As soon as we would approached the pool, the staff would come to prepare our loungers with two fluffy towels and leave a glass of iced lemon water on the table. 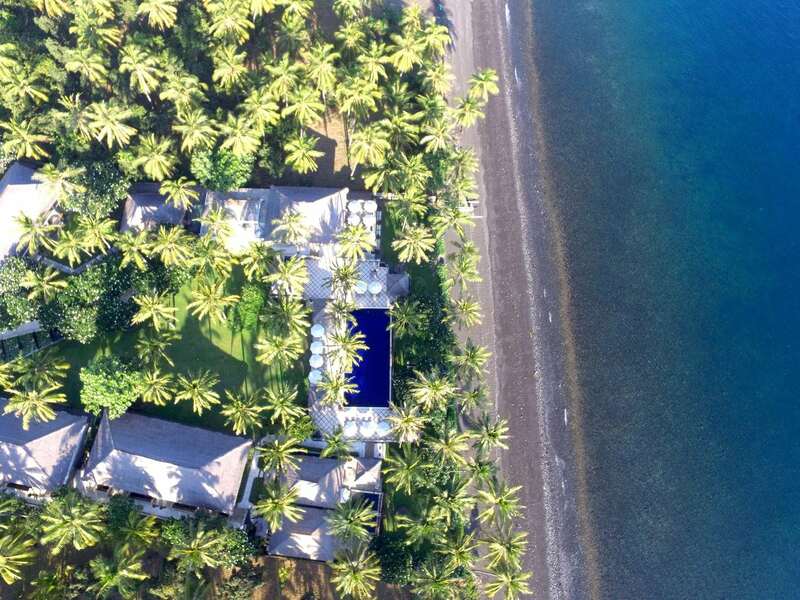 The indigo blue tiles of the pool contrasted with the green of the grass and the black of the beach to provide a feeling of depth. 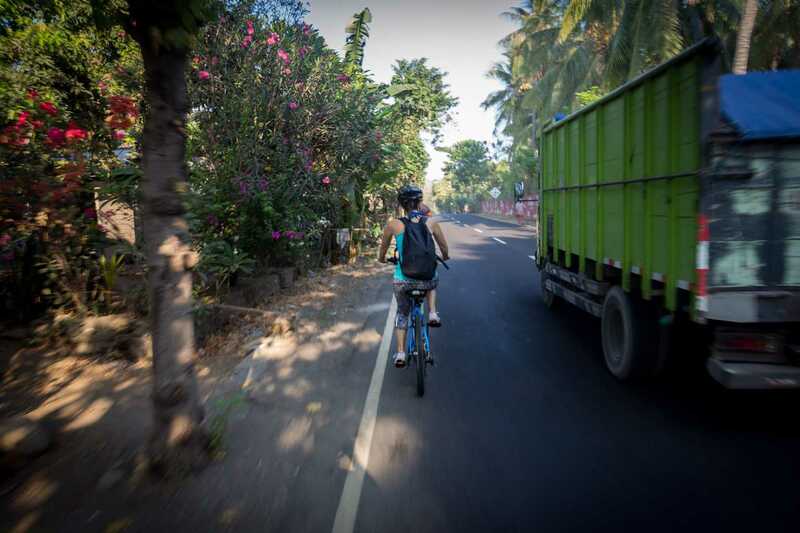 This was not the turquoise blue of the Southern Beaches, this was the profound and rugged Bali, the traditional and historical part of the island where locals grow rice, chicken roam freely and fruits grow on trees. The original Balinese way of life, of which there is so little left, is still alive here. Aside from the pool, the resort also had a well equipped gym and a yoga swing from where to practice aerial yoga, in front of the beach. There was a TV room to watch movies or important sports games, but the resort’s lack of WiFi quickly gave us an excuse to disconnect and reconnect with each other. Aside from the usual activities available at any beach resort, Spa Village Tembok is focused on providing an insight into local life. Almost the entire staff is from the area, not just from Bali, but from the local villages around the resort and they share their knowledge with guests through the various available cultural activities. Every day, there are three activities, free of charge, that guests can participate in. 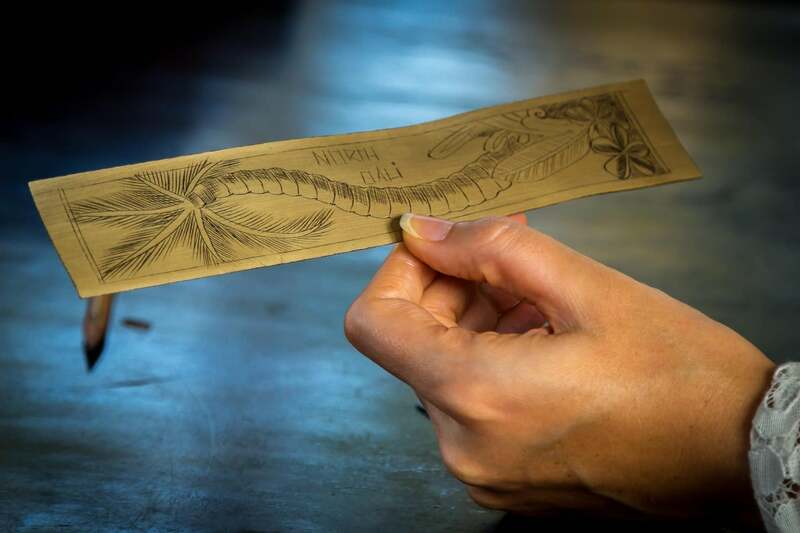 We drew our own bookmark on a lontar leave, a traditional art that was used by Balinese people to pass stories from on generations to the next. As the resort is a Spa Village, the scrubs, soaps and blends used in the Spa are made with primarily local ingredients in-house. We made our own Boreh scrub, the mix that was used in our massage (see below) by pounding ginger, galangal, turmeric and clove together. Boreh is used not only to get rid of the dead cells but also as a cure for other ailments. The more clove and galangal the warmer the boreh. 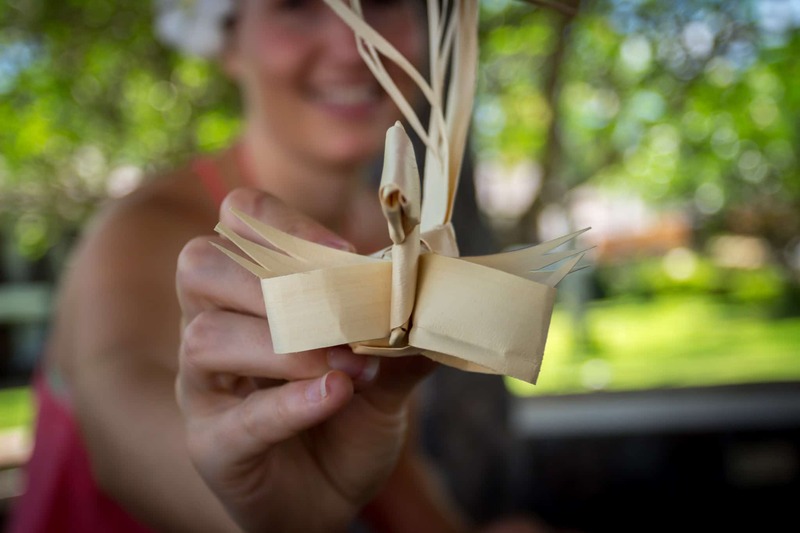 We also weaved our own canang, or Balinese Hindu offering in the shape of a bird that is often filled with rice then steamed and offered to the Gods in the temples and local homes. 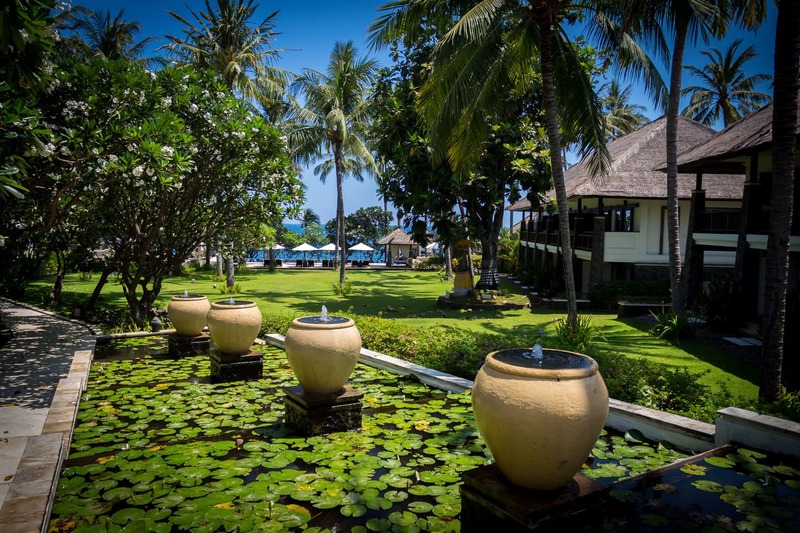 Every morning and every evening there were complimentary yoga lessons on the grass and once a week, there was a cooking class with the in-house Balinese chef. 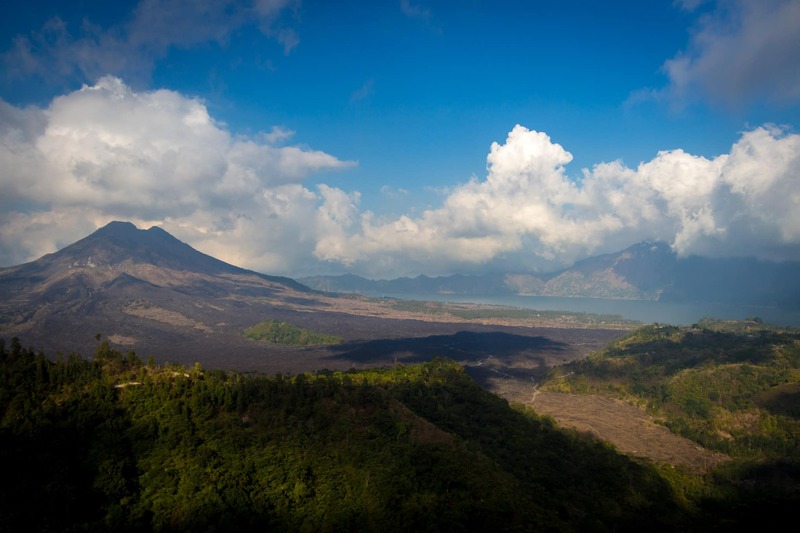 The North of Bali is known for Mount Batur and Mount Agung, both of which can be climbed overnight to see the sunrise. Mount Agung is higher and father and it requires leaving the resort before midnight whereas Mount Batur can be trekked to in the early hours taking about 2-3h to climb. 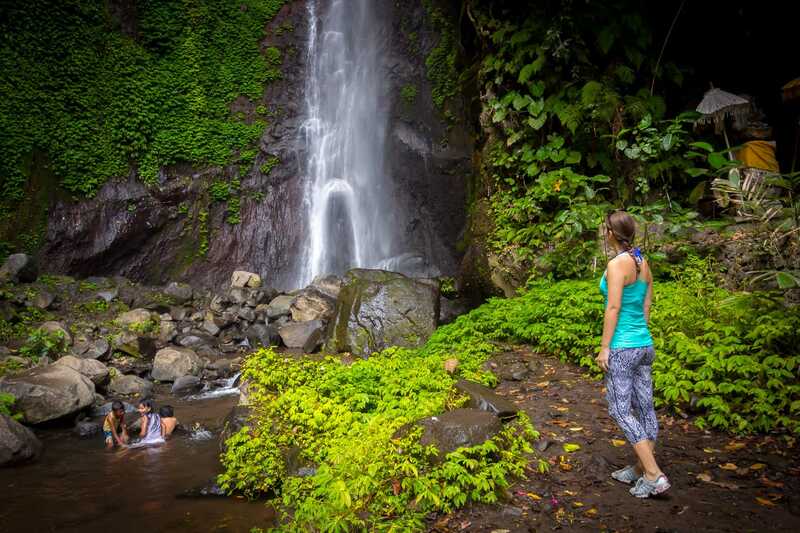 Other excursions in the area can take guests to waterfalls, Les Waterfall being the closest one about an hour and a half cycle and trek from the resort. The first 45min are cycled on the paved road. The following two kilometers are steep and through a rocky, muddy or dusty (depending on the season) gravel road, and the final stretch is a walk through the forest. The cycle can also be replaced by a car ride. The waterfall is cooling and practically undiscovered by any tourists. The only people there were the local kids taking a dip as it was Sunday morning. We left early to avoid the heat and our guide packed some pastries and fruit to have breakfast there. There are other interesting excursions to see the Kintamanis terraced rice paddies, a very beautiful part of Bali, and the lake inside Mount Batur, from a viewpoint. The Hotel also offers half and full day trips to an art village, to Tegalalang, an artisans’ village, or to Tirtagangga Water Palace, once the resting villa for the king and today a sunken water palace. That part of Bali is also close to white water rafting facilities. On site, the activity staff can teach silat, a Balinese form of martial arts, and traditional Balinese dancing. For water lovers, a sunset boat rides into the horizon, to watch the sun set behind Mount Batur on a traditional fishing boat, is a nice way to take in the ocean vs. mountain views. This is not a plush boat but a true fisherman’s boat. If you are lucky, you may spot dolphins. One of the most interesting, fun and relaxing activities to do is the Starlight gazing. 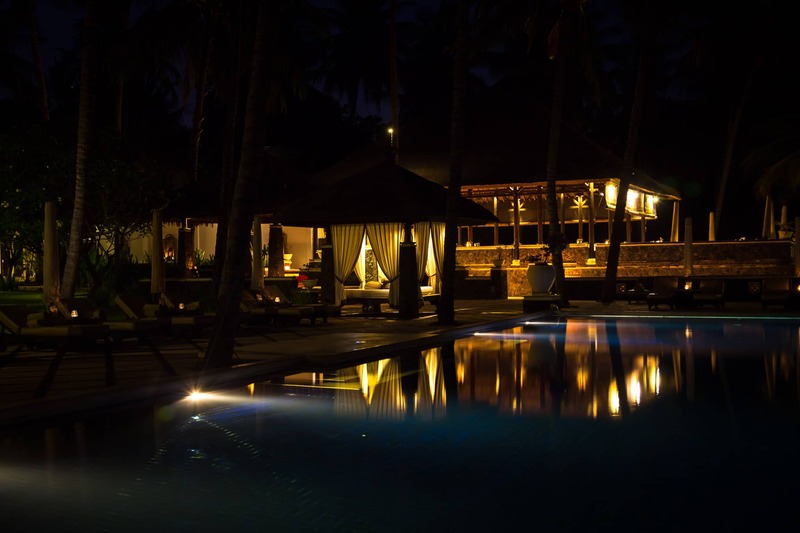 The staff places a large floating bed on the pool and you can lay down to watch the stars as the water serenades you. It was fun and we giggled like little kids as we were being pulled around by the staff. The resort is indeed a Spa Village. YTL Hotels is known for its fabulous Spa Villages located in some of its top resorts. 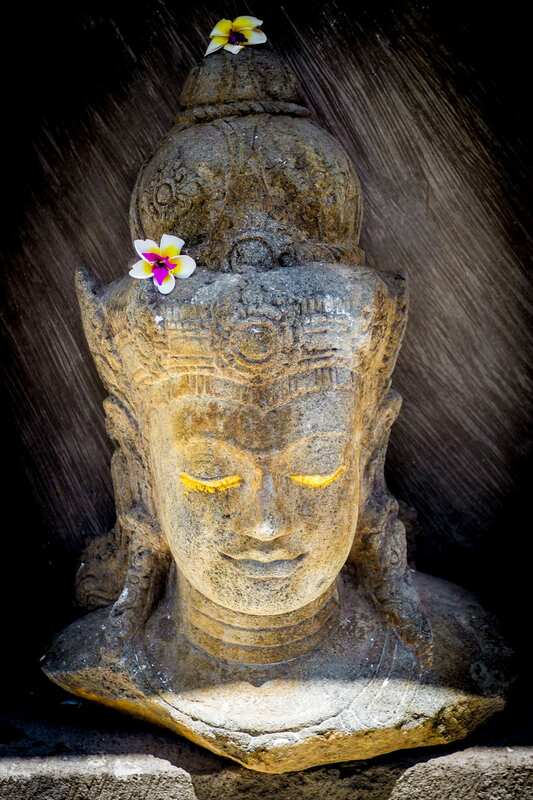 Spa Village Tembok is, however, entirely centered on the Spa and the wellness elements. I felt that the Spa deserved an entire piece which you can find here. The resort is cozy. With only just over 30 rooms, there is only need for one restaurant. Most guests will stay in for every meal unless they were out for an excursion so providing good food and variety is key. The food was simple and fresh and the menu changed daily. We always had 3-4 starters, 4-5 mains and 2 desserts to choose from. The mains always included a raw and a vegetarian option, in keeping with the purification and wellbeing spirit of the resort, and the fresh catch of the day as a seafood dish, freshly bought from the local fishermen. One evening, the chef came to chat to us and offered to prepare us a typical Balinese meal from that part of the island, especially for us, the following day. We were excited and it was a great decision. We had a delicate broth followed by a fish and a chicken curry with sambal sauce to our desired level. It was an excellent and personal meal. The hotel also offers private beach dinner under the stars, much like we had for a massage but for dinner and I am sure this would have been an unforgettably romantic experience. YTL Resorts have gained my enthusiasm and love because of their personal and local hospitality that is so good it has to be genuine. The staff are friendly and our stay was filled with lots of small details. Every interaction with the the staff felt like we were visiting their village and we had been welcomed into a wonderful family. What surprised me already during my stay at Gaya Island Resort was the long tenure of the staff. 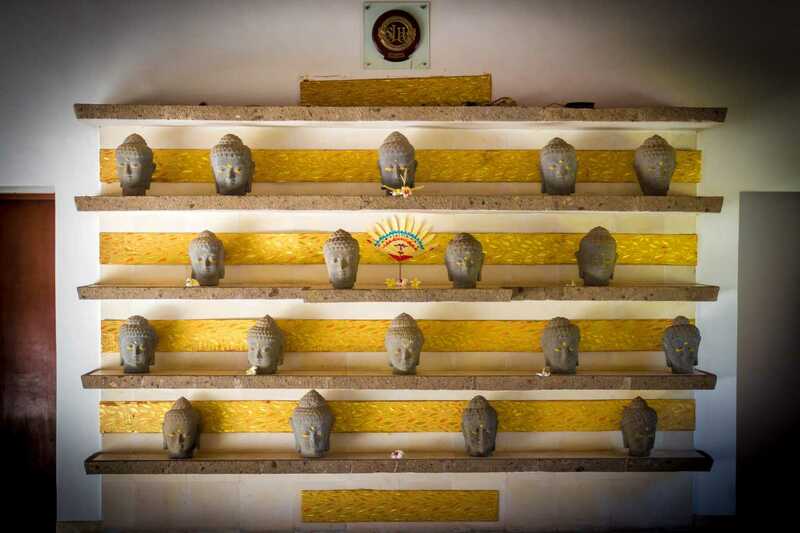 At Spa Village Tembok, most of the staff were hyper-local, that is, from the village of Tembok or the one after, and had been at the resort for many years, some were there even before YTL tool over years back. Our nightly bed time notes with the beautiful frangipani flowers, the gorgeous beach path to our massage under the stars, the friendliness of the staff when we sat down for every meal or the attentiveness of each member of the team when we were taking part in the daily activities were a constant reaffirmation that YTL must be doing something right with their staff. In a competitive industry like hospitality, caring for and keeping staff is difficult but they have managed to crack the formula and it shows. 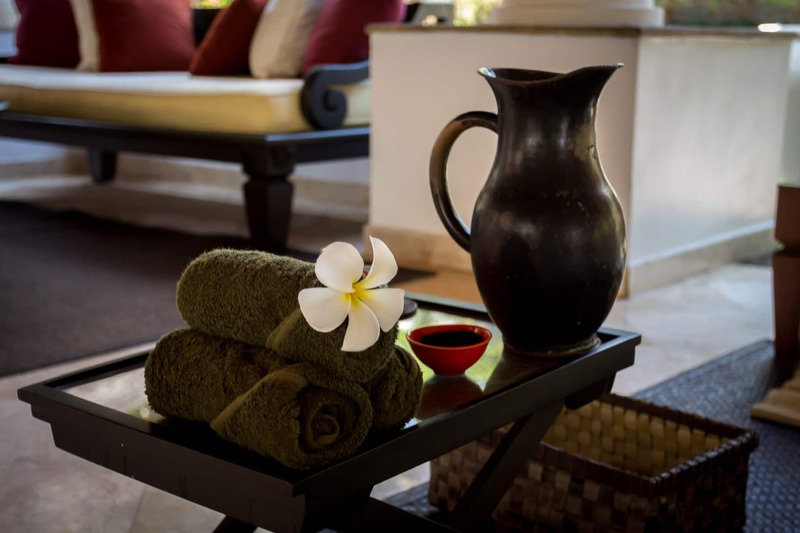 If you are looking for a place to disconnect and re-connect with your loved one, Spa Village Tembok will bring romance back into your life. Spa Village Tembok offers three night Return to Yourself retreat package for solo women or groups up to 4 people for $1,500++ per person Private or $900++ Twin sharing with daily yoga, meditation, tours and massages plus full board or a Recharge & Reconnect Retreat rate for couples starting at $180++ per night with daily massage and full board.